This is just one of the designs in our collection of Ordination Anniversary keepsakes. Each one is personalized especially for the recipient. Each is printed and finished one-at-a-time. None of our artwork is mass produced. We use premium paper with Ultrachrome archival inks for vivid color, exceptional detail, and a lightfast rating of at least 100 years (as with any artwork, avoid hanging in direct sunlight). Your artwork will be double-matted with crisp, white premium quality matboard. 100% cotton and acid free, it will not yellow over time. 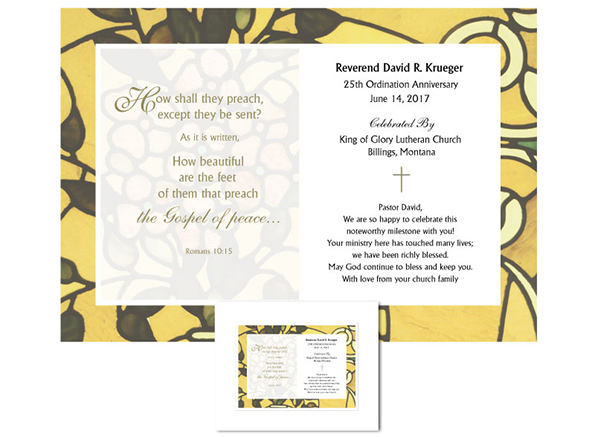 It’s then mounted on archival backing board and placed in a clear, protective sleeve – suitable for presenting to the recipient. Outside dimensions are 11”x14” – the artwork will fit any frame of that size. Is there a pastoral ministry milestone approaching at your church? Check out the collection here.